Chastity Belt brings the '90s nostalgia, but forgets to bring the variety along with it. Nostalgia for the '90s isn't exactly hard to come by in today's musical climate, but few groups are as devoted to that time period as the all-female grunge act Chastity Belt, a group whose records sound so much like the early '90s that one half-expects to find out that they arrived in the present day after hitting 88 MPH in a Delorean back in 1993. It's little surprise that they ended up on Sub Pop, as the possible time travelers would have been right at home on an early Singles Club release -- possibly what they were on their way to record when lightning hit a clock tower at just the right time and sent them forward two decades. 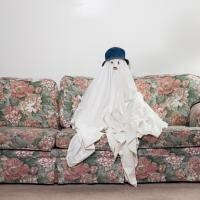 Although their previous album, the cheekily misspelled No Regerts, was released through indie label Help Yourself, their new home on Sub Pop's Hardly Art imprint suits them much better. In fact, with the help of some pitch-perfect throwback production, the group's Hardly Art debut Time to Go Home sounds more like it came out of the '90s than any of Sub Pop's still-active groups that were putting out records back then. The appeal of an album that sounds like Time to Go Home is largely in the stark contrast between it and almost everything else to come out alongside it. Succumbing neither to the trap of overdoing it on the lo-fi fuzziness -- the instruments and vocals are clear throughout -- nor sounding too "clean" as contemporary rock is occasionally known to be, the album from a purely aesthetic standpoint sounds fantastic. Treble-heavy guitar lines cut through rumbling bass and a tiny bit of gate on the drums gives every hit that much more of a purposeful, deliberate feeling. Recording engineer José Díaz Rohena does a brilliant job of making sure everything sounds exactly as it should. However, the actual music is a touch more problematic. While the '90s Seattle scene homage that serves as Chastity Belt's modus operandi is a boon in some ways, it is also severely limiting. There is an incredible dearth of musical variety on Time to Go Home, with the sole hard-rocking track "The Thing" one's only hint that the band's repertoire expands anywhere beyond the downbeat melancholy of the rest of the album's songs. The few flashes of variety to be found that hint at possibilities of a more interesting album in the band's future, like the subtle flanger application lending a psychedelic accent to the lead guitar in the instrumental conclusion of "On the Floor". However, Time to Go Home suffers for picking one musical theme and overcommitting to it. The band has stated a desire to move past the dirty rock sound of their indie days and on to something cleaner and more contemplative, but a mix of both styles would have been more musically compelling; as such, Time to Go Home seems like half the album it could have been. Chastity Belt has the right sound and they briefly flirt with the idea of trying some new things with it, but hopefully next time they won't be afraid to go all the way.